This Royal Blue Maxi Romper with Criss Cross Back is so pretty! It features a bold Royal Blue color and criss cross back. Such a beautiful maxi romper to add to your wardrobe! First purchase with savedbythedress. 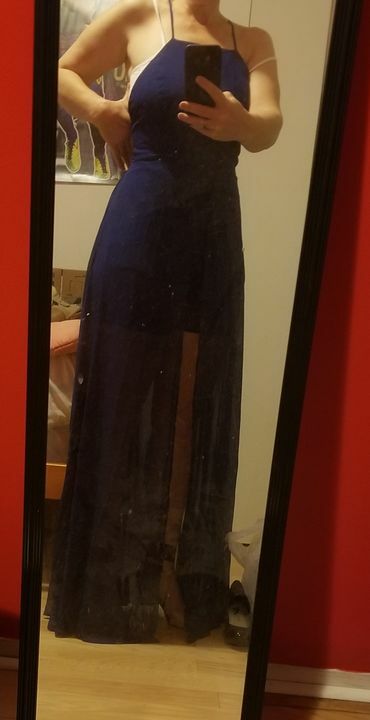 Bought this dress for a beach wedding I'm attending. I hate my legs so I wanted something to kind of disguise them. This dress is absolutely perfect. Delivery was quick and I couldn't be happier. Brianna K. Reviewed by Brianna K.
Romper fits great! Use the adjustable straps to get it to fit the way you want. I had to remove the tag in the back as it was very irritating but fine after. Received tons on compliments. Lorena T. Reviewed by Lorena T.
Kari K. Reviewed by Kari K.